I’d always sung this song thoughtfully, meaning it. But some years ago I felt God challenge me as I sang. What about when you’re not walking on the water? What about when you’re in deep, over your head? What about when you feel you’re drowning because you’re so far out of your depth, when you can’t breathe? Will you still follow? Will you still trust? I had to think carefully about my answer, but ultimately my yes was nothing more than re-committing to the Lord who I had followed and trusted for years. How could there be any other answer? That moment was key because I spent much of the following months feeling very much as if I were drowning. Often I felt so far underwater that I couldn’t see the surface anymore and I didn’t know when I could next come up for air. It’s difficult to explain why I was feeling like this, even to myself – but it was hard and I often felt lost. All I could do was hold tightly to Jesus’ hand and keep my eyes on Him. It was a constant battle – one I didn’t always win. When I read back through my journal from that period, there’s a sense of desperation for God and frequent reminders to myself that I trust Him. I saw His faithfulness again and again as He brought me to the surface for air just when I couldn’t keep going any longer. And He never let go of my hand, even when my grip was slipping and my resolve was gone. Was my faith made stronger? Yes. After this had gone on for more than a year, someone prayed for me and had a picture of me standing with water rushing around me, rising but never above my head. She saw me standing firm – not moving or flinching. She said it was a reminder to me that when I find my strength in God, I cannot be shaken. It made me realise that I wasn’t drowning any more. I did still feel the odd wave crashing over my head, but overall the waters were receding and I could touch the bottom, feet firmly planted in God and hopeful that things were changing. It remained a hard season. I felt my job was simply to stand firm and trust in God, so that’s what I fought to do. There were many things I thought I might hear God say, or wanted to hear Him say. What He did say was not what I expected. (No change there then! I love that God’s character is unchanging and yet He surprises me all the time.) He simply kept repeating the same things over and over again: I love you so much. I’m so proud of you. I’m here with you. It jolted me every time because I felt such a mess, such a failure. He was teaching me about identity again, more deeply. ‘As Isaiah 43 states, our identity is in Him, not the fire, flood, or storm. Eventually things changed and I felt washed up on shore after the storm, lost and broken and numb and utterly exhausted. I felt like I couldn’t even see God anymore, let alone hold on to Him. But He was right there, and He invited me to sit quietly on the beach with Him for a while, my head on His shoulder and His arm around me. After some time in His presence, I started to talk about all that happened. I cried and He held me tightly. Then He began to speak, to help me make sense of things. I felt broken into tiny pieces. To some extent, I still feel broken. I feel that now God is putting the pieces back together into something new and more beautiful than before. It’s a time for healing and newness. A lot of people are asking me what I’m doing with my life now. I guess that’s the answer. I’m giving God space to make the pieces of me into something new and more beautiful. He is so careful with every detail. There will come a point when it’s time to venture back out onto the ocean. Maybe this time I’ll get to walk on the water! It feels a bit scary to contemplate going back out there because there are no guarantees that I won’t start to sink again. But the Lord has promised to go with me and I know He will never let me go. And ultimately I know that I’d rather be drowning with Him than safe on the beach without Him. Sometimes this is too much. I am missing too much. I am missing babies being born, and growing up. I am missing their milestones. I am missing out on newborn cuddles, toddler games, 3-year-old questions and 6-year-old stories. I am missing seeing their beautiful smiles and hearing them laugh at the smallest things. These ones, these missings, are the hardest because they can’t be replaced or regained, because the little ones don’t understand why I flit in and out of their lives, why for months at a time I appear on a computer screen and won’t come out of it to play with them. I miss my friends – those friends who know me and still want to be my friend, those friends who welcome me into their homes and families and lives. I miss my precious family, who are the best. Right now, living in the tension is hard. I want to be here and also there, have my cake and eat it I suppose. I wonder if it’s because I’m being challenged to a deeper level of commitment, of surrender, although I’m not quite sure yet what that means. What I always come back to is that God is worth this, much more than this. I have promised Him many times to follow where He leads. There’s a John Wesley covenant prayer that I picked up at a church as a teenager and kept on my wall for a long time. I have prayed it thoughtfully and with sincerity over many years. After all is said and done, it still expresses my heart and my desire. And the covenant now made on earth, let it be established in heaven. This is your country now. I got back yesterday from Camp Zoe, a Christian camp for some of the teens we work with here in Thailand. It was a great 5 days of building relationships, having fun, playing crazy games and helping the kids get to know Jesus a little better. My team at Crazy Night. Our costume theme was… crazy? 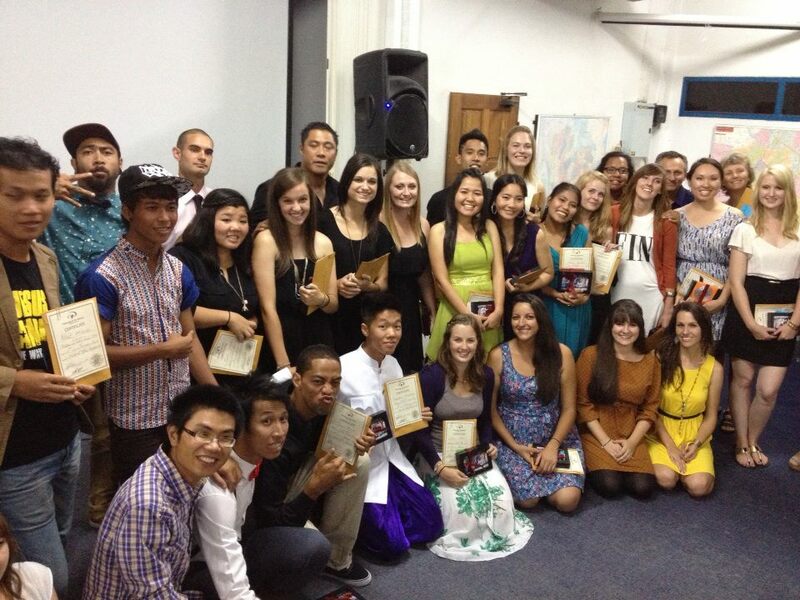 The last night was a worship night and we spent some time thinking about being a light to Thailand. 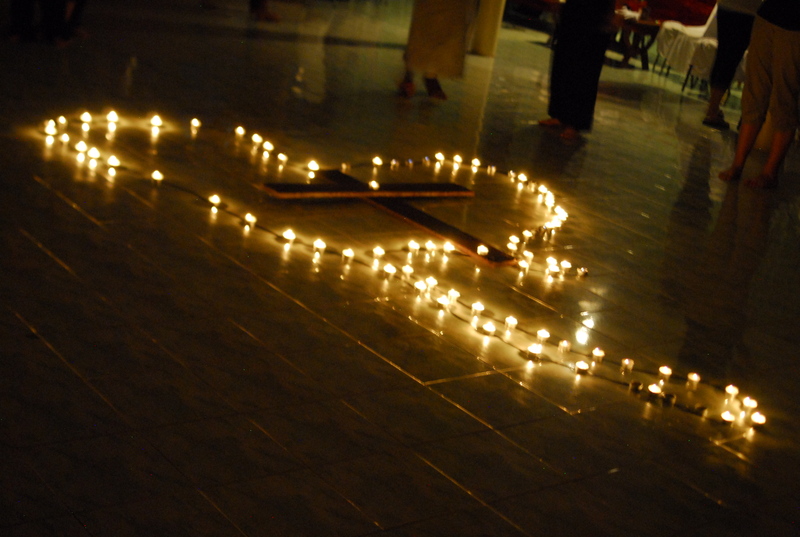 There was an outline of Thailand marked on the floor, with a large wooden cross in the centre. On the cross was a candle. The idea was that we would light our own candles from the one in the middle and set them round the country outline as a symbol that we want to be God’s light in the darkness in this country. My friend Brandi, who facilitated this, asked everyone to consider what purpose God has us here for. I started thinking about this for myself, not just for the young people. Very quickly, and very clearly, God said that if I lit a candle, it would be a symbol of committing to stay in Thailand – not just shining God’s light in Thailand during this DTS outreach, but staying here long beyond that. I knew I was staying in Asia, but I hadn’t quite been sure what specific country. I hadn’t been fully committed to Thailand longer-term. So I took some time to think about if I wanted to make that commitment by adding my candle to those others were lighting. Shining God’s light all around Thailand. I did light the candle and add it to the map. In some ways, it wasn’t easy – I needed to again surrender some of my own ideas and hopes and dreams. But as I made this symbolic gesture and sat looking at the map, I felt the Spirit whisper, ‘This is your country now.’ Not that Northern Ireland will ever stop being my country, but now Thailand is my country too. This makes me really happy. So Thailand is where I’m staying, where God is calling me to shine his light into the darkness. For how long? I don’t know. I’m not completely sure in what capacity I’m staying either, but I think I’m getting closer to knowing that too – watch this space!